For Christmas I received a copy of this new book, and haven’t been able to put it down. In both my mind and bookshelf it has very quickly joined the small collection of gardening books I find truly essential. Key to creating an attractive landscape is ample use of shrubs and ornamental trees. Some experts write that shrubs act as the “bones” to a landscape, an analogy I don’t follow. Bones get covered up, and add support unseen. The shrubs and small trees covered in this book deserve very much to be focal points in the landscape, and in all cases will add shapes, colors, and textures to your property that help turn a mundane yard magical. As far as most gardening book and magazine publishers are concerned, Minnesotans live on a different planet. It gets cold up here, and our selection of plant material is limited. This is why so few magazines (and even fewer books) provide comprehensive information on plants that thrive in the north. This book is filled with nothing but. The authors include virtually every winter-proven, worthwhile variety of plant within each of the fifty genera, such that the book covers over 750 different shrubs and trees in all. In a stunningly simple move, they actually include the names of the nurseries where you can buy the darn things (ignoring that little detail being the flaw in far too many plant books). Then in lucid prose they explain everything you need to know in order to achieve success: Where to plant; soil, moisture, and spacing requirements; how to plant and transplant; how to fertilize and mulch; how to propagate; problems to watch for; winter care, and more. Nancy Rose works in the woody plant research program at the University of Minnesota Landscape Arboretum, with a stint prior at the Morton Arboretum outside Chicago. Wonderful speaker if you ever have the chance to see her. Don Selinger is a long-time nurseryman at Bailey Nursery in St. Paul. John Whitman is a Minnesota gardener and garden writer who has contributed to numerous gardening books over the years. 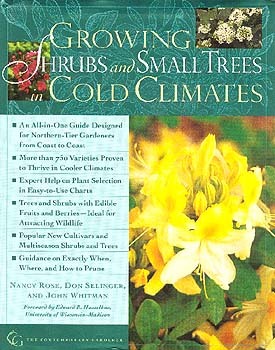 Combined with first-class photography covering many of the individual varieties, Growing Shrubs and Small Trees in Cold Climates joins the first two books in the series (Growing Perennials in Cold Climates and Growing Roses in Cold Climates) as an indispensable guide for northern gardeners.